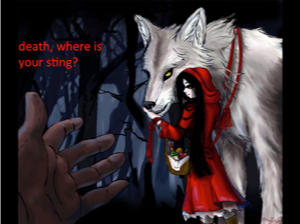 I used to love the story of Little Red Riding Hood. There was something deliciously appealing about getting dressed up in an elegant red cape and sauntering off into the world alone. Grandma turning into the wolf didn’t bother me, perhaps because I was so absorbed in the elegance of my outfit. But there’s no getting away from the fear and vulnerability that arises when we contemplate the deliberate ending of human life. Questions of identity, who am I? Does my life have meaning? Questions of power, if I don’t fit the dominant, powerful group, will I have a place? Am I of worth if I am fragile, dependent and non-productive? And what’s more, like the story of Red Riding Hood, what if those closest to me decide to do me in? If you’re a health professional, another set of questions may loom that push at the commitments made at the beginning of your practice. Questions that now make you wonder who you are, what ethics you subscribe to and how change about the meaning of life can be accommodated within the professional life you have built. Despite all these questions, I’m an avid supporter of the right to choose the time of our death when suffering overbalances meaning. I have no doubt that the law will change in Aotearoa New Zealand but I don’t want the law to change as a result of frenzied political lobbying or debate that is really only a trading of position statements, only includes a limited expression of views and, in the process, minimises our various vulnerabilities. Even whilst knowing the fragilities around this discussion, I still have a dream that sets out a rather broader scenario. My hope is that we are able to develop a philosophical, spiritual and legal framework within which people have a clear and protected right to die. And if I don’t have a right to die, I want to know why not. Once that right is established, I think we must honour this choice as a valid and valued rite of passage with as much ritual, music, colour, art, poetry, song and community connection as any other, until one day, midwifing into death this way may be the preferred way to die……. …. When it’s time for me to go, I hope we have managed to get to the point where I have the right to choose to die. I want no funeral, instead, I want the people I love to come and be with me to listen to beautiful music, to sing, to read some of my words and those of others, to share our memories, to tell our stories one more time. And when it is time to help me die, to midwife me into death, not because they want to get rid of me but because I have chosen this and they do it as a final act of love. You know, hardly anyone gets past the bit in Red Riding Hood where she’s eaten up by the wolf. That’s a shame because she comes back to life again. But the entry into the beast, that which she feared most, the exploration of death, the longest dark night of the soul, was the only way that was going to happen. It is our shared vulnerability on this incredibly difficult journey that is the key to soulful and just end of life choices, the key for us to learn about midwifing into death. I advocate finding ways to do it with the people who disagree with us. Sande I thought I’d let you know that I have rather suddenly found myself feeling much more positive about euthanasia. I won’t go into it here but will begin to explore it more seriously in the coming months. I have always been very aware of your unequivocal support for euthanasia. Now I begin to appreciate very much your boldness. I guess the wonder of being human is the ability to keep thinking and imagining with the result that we sometimes change our mind. All the best to you as you ponder. Always up for a conversation if needed.